Our Laser Starfield Projectors are being used in an enormous array of creative installations like this one. Here you see a photo of the 2010 Ice Music Concert with lighting effects from our BlissLights BL-50 Laser Starfield Projector. We have found that snow and ice are particularly good projection surfaces for our lasers and LEDs as the light permeates the surfaces with brilliance on the pure white or clear surfaces. Our landscape lasers put on fantastic light shows during snow storms which can be viewed from thru the window from inside your warm home. Here is information the Ice Concert Series. At the center of the Enchanted Circle exists, The Celestial Sphere The simple facts of Ice Music in the Celestial Sphere challenge the imagination of every person who encounters it. It’s hard to believe. The Celestial Sphere Ice Music concert hall is a series of vaulted igloo style white-ice domes interlocking to form the world’s most unique musical venue. Flowing monolithic construction, exotic lighting, and lasers glistening and dancing off the ice walls create an other-worldly experience, it’s like going into “A Nightclub in Heaven”. The dance floor is ice, the bar is ice, even the drinks are served in glasses made of ice. 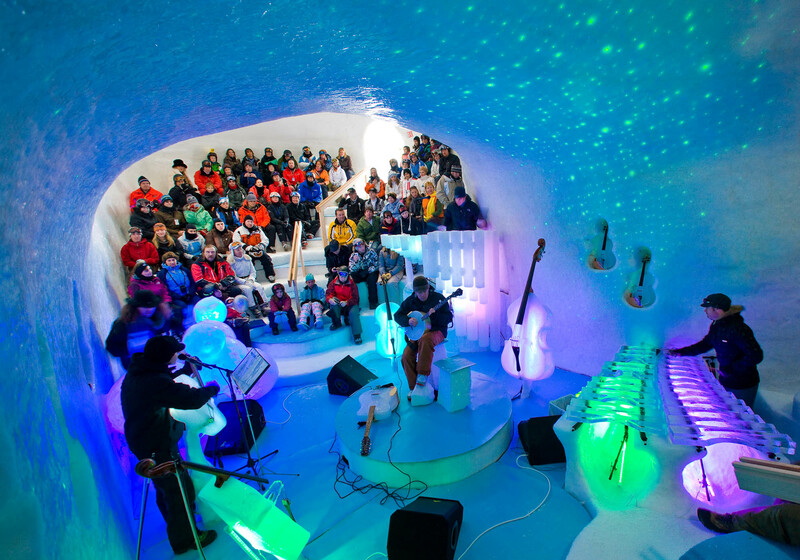 The Band plays an orchestra of hand-sculpted ice instruments as translucent and luminous as angels, “The Living Ice Orchestra”; violins, viola, cello, bass, guitars, banjo, mandolin, xylophone, rolandophone, drums, and flutes,…..honestly. You may find it difficult to believe the music you are hearing is coming from the ice itself, the sound is crisp, rich, and energetic, like light shining through clear water. Musical events range from classical strings to blue grass, rock & roll to new age esoteric space music, mariachi, tango, and Texas swing. We invite you to join our party as we explore and celebrate Earth’s most precious and prolific substance, ice-water-vapour, through music and imagination. How to get there: The Celestial Sphere is located high in the Sangre de Cristo mountains of northern New Mexico at the center of the Enchanted Circle in Taos Ski Valley. It is located near the Phoenix restaurant and can be reached by skiers at the base of the Kachina or #4 chairlift on the back side of the mountain. The Celestial Sphere can also be reached in your car by driving up from the Taos Ski Valley to the start of the Williams Lake trail and Bavarian Restaurant & Lodge (winter travel 4x4 only). Shuttle service is available from Taos Ski Valley with pick-up at the Stray Dog Cantina. Call 575 776- for reservations or pick-up.